The new Bryant Calandra is a bowrider unlike any we've seen before. 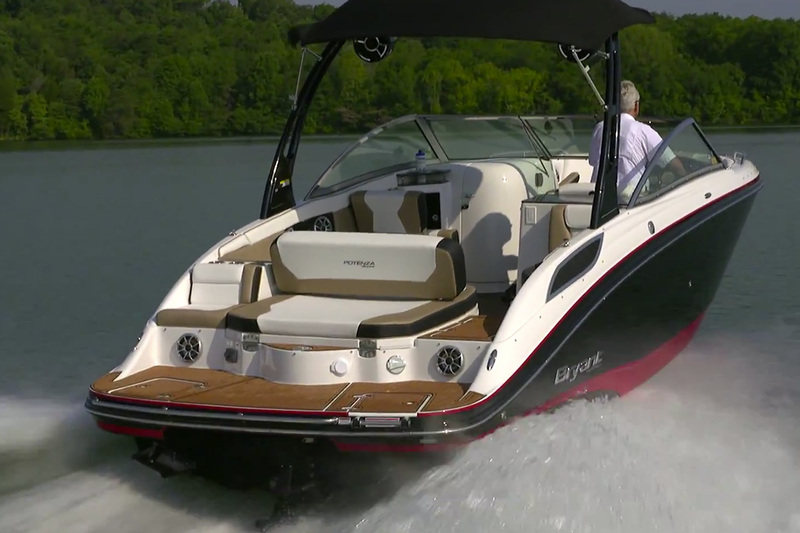 Now you can see it, too, in this video boat review. 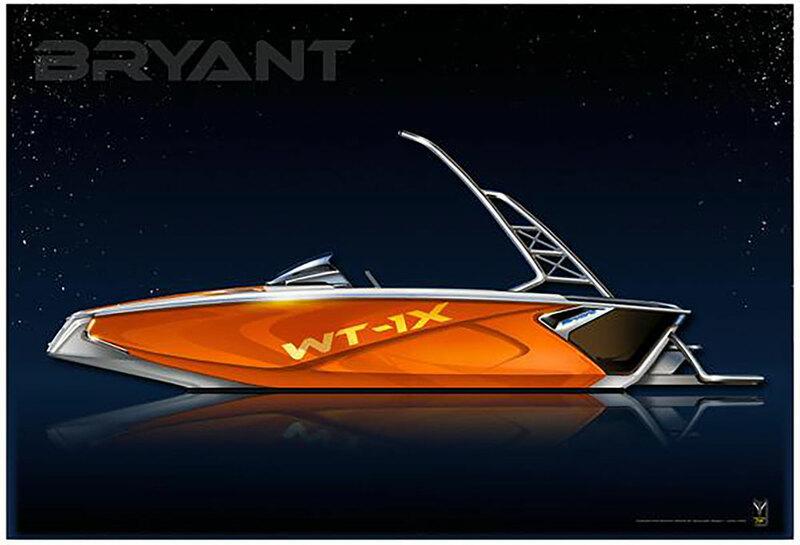 The 2015 Bryant Calandra is a 23-foot 4-inch runabout designed to make the most of its interior space and deliver an extra dose of comfort. We were really impressed with the fit-and-finish and attention to detail we found on this boat, its top-quality components, and solid feel in the water. Our video boat review took place on a blistering hot afternoon on Lake Tellico in Tennessee; click on the picture below to watch. 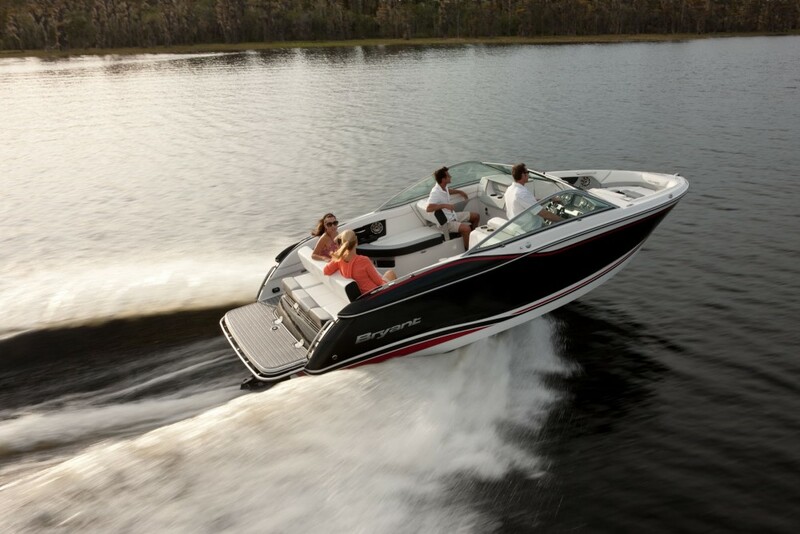 A premium-quality runabout that offers outstanding comfort and loads of room. Not a splinter of wood to be found in this boat, even in the transom, which is cored with Coosa Board, a high-density foam material infused with glass fiber and resin that's lighter, stronger, and more durable than laminated wood. Hatches are lipped to keep out rain water, and the gutter around the engine hatch drains overboard. Bryant even carefully finishes the hull-deck joint, visible in the engine bay. 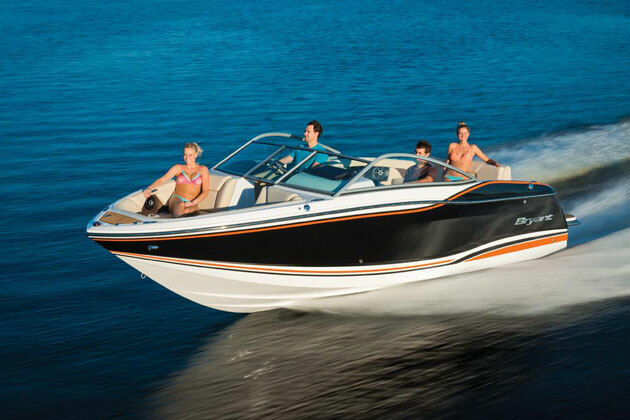 This was our first test with the new MerCruiser 6.2L V8, a marine-specific engine that places all maintenance points on the front of the engine and aims the air intake aft, away from the cockpit. The engine is peppy and very quiet. Top speed was an impressive 51.5 MPH at 5400 RPM. Fuel economy stayed between 3.5 and 3.2 MPG from 3000 to 4000 RPM. Nothing amiss in this department. The 20-degree hull tracks well, responds to trim, and delivered a smooth ride, although we were testing in flat-calm conditions. 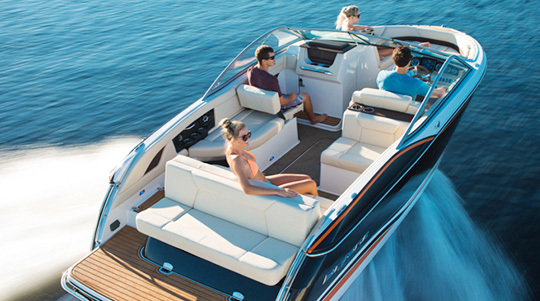 Instead of the wrap-around cockpit seating we see in most runabouts, the Calandra has seating stations molded with the liner. This seems to give the cockpit more open space, and the walk-through to the bow and swim platform are wide and easy to navigate. Each seat is deep and is also positioned about three inches higher off the deck than normal, which makes a surprising difference in comfort. Head comparment is roomy. Our boat was not equipped with a MSD, so this was a big stowage space. We’d like to see some kind of ventilation here, for when it's used as a head. The rear seat has one section facing the cockpit, another facing the swim platform, and it all folds flat in seconds to create a huge sun lounge. Aluminum sport arch has a tow point, Bimini and LED cockpit lighting. Handy wet-stowage compartment in the platform is perfect for a tow line. 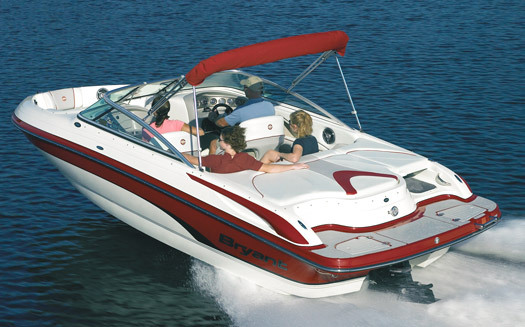 For more information visit Bryant Boats. You can also see our First Look Video of the Calandra, or see some current Bryant Calandra listings.